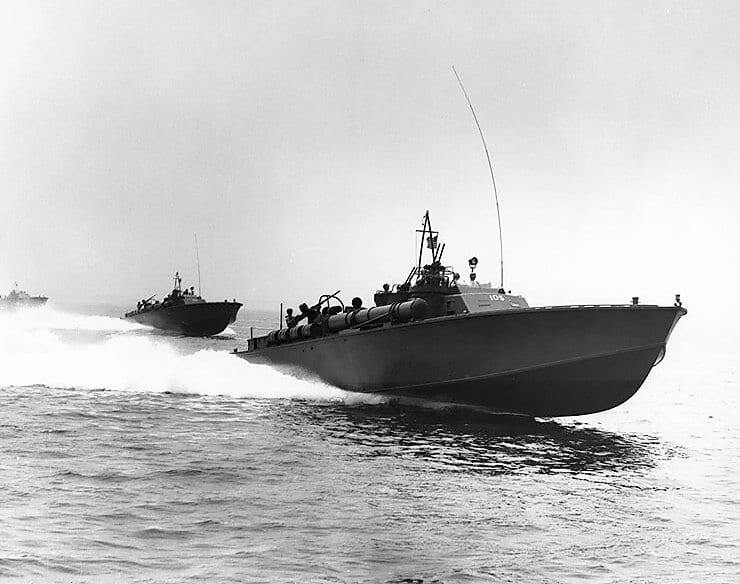 As the skipper of a patrol torpedo boat, or PT, Kennedy received an award for heroism. Some, including the future president and his family, believed it was the wrong award. The collision was the beginning of a long, traumatic night that may have caused Kennedy’s lifelong battle with chronic back pains. Shortly after Japanese forces withdrew from Guadalcanal, the scene of the first major United States offensive action of the Pacific war, Kennedy was on the scene and charged with interdicting enemy shipping during the fight to capture New Georgia. On Aug. 2, 1943, shortly after midnight in pitch-blackness near Guadalcanal in the Solomon Islands, the Japanese destroyer Amaguri was steaming at 40 knots when it slammed into Kennedy’s mostly wooden, 80-foot, 56-ton displacement patrol boat, the PT-109, and cut the boat in two, killing two U.S. sailors, Seamen Andrew Jackson Kirksey and Harold W. Marney. The collision was the beginning of a long, traumatic night that may have caused Kennedy’s lifelong battle with chronic back pains. Historians differ as to whether the captain of the Amaguri – which suffered damage to a propeller – even knew the PT boat was there. The boat’s crew saw the destroyer coming and was preparing to fire torpedoes at it. The collision ignited fuel tanks aboard PT-109 and set the boat afire. Those aboard PT-109 included Kennedy, executive officer Leonard Jay Thom, ten enlisted men, and a Kennedy friend, Ensign George H. R. Ross. With no moon and little light, visibility was dismal. As Amaguri steamed away, the destroyer’s wake doused the flames on the floating section of PT-109, to which five Americans clung: Kennedy, Thom, and three enlisted sailors. Kennedy managed to find and rescue Ross and five other sailors. The survivors made their way to an island and were rescued four days after the collision. With the aid of a coast watcher and local residents, PT-109‘s men were finally returned to Motor Torpedo Squadron Five’s base at Rendova Island near New Georgia on Aug. 8, 1943. Kennedy’s remaining time in the Navy was less eventful. In September 1943, Kennedy went to Tulagi and took command of PT-59, which was scheduled to be converted to a gunboat. In October 1943, Kennedy was promoted to lieutenant and continued to command PT-59 when his squadron moved to Vella Lavella. There, a doctor directed him to leave sea duty. Kennedy returned to the United States in January 1944 and served at the Motor Torpedo Boat Squadron Training Center in Melville, R.I. Due to the injury of his back during the sinking of PT-109, Kennedy entered a hospital for treatment. In and out of hospitals in the weeks that followed, Kennedy was released from active duty and was retired from the Naval Reserve on physical disability in March 1945. Apparently taking the view that the collision between destroyer and PT boat did not involve direct combat, the Navy awarded John F. Kennedy its highest non-combat decoration for heroism, the Navy and Marine Corps Medal. Kennedy also received the Purple Heart – generally considered a combat award – for his injuries. Kennedy’s father, Joseph Kennedy, Sr., was not pleased with the choice of award. 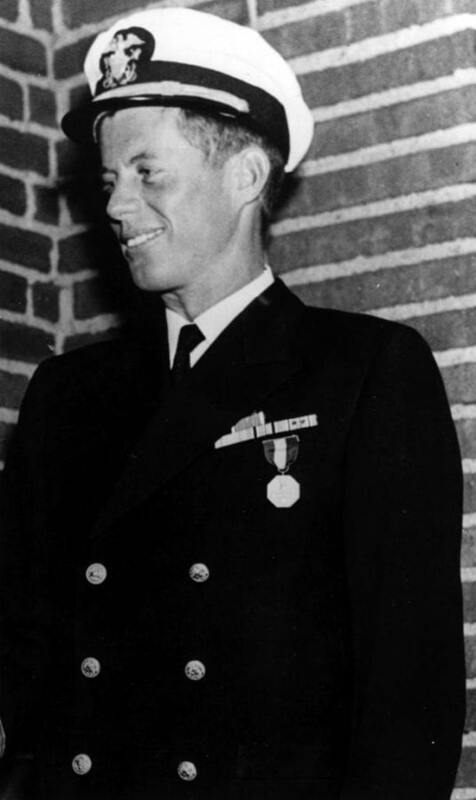 According to correspondence on file with the Navy’s Board of Awards and Decorations, the elder Kennedy argued that his son should have received the Silver Star instead. Nothing more was done about the award, and the matter ended with Kennedy’s assassination in 1963. In the late 1940s, out of the Navy and preparing to become a freshman member of Congress, John F. Kennedy formally asked the Navy to review his records. He argued that, because the Japanese ramming of PT-109 had occurred during combat, he should have received a combat award for gallantry. On Feb. 27, 1950, the Navy’s Board of Decorations and Medal wrote to Kennedy. “Since this was a lifesaving case following an attempted torpedo attack on a [Japanese] destroyer,” wrote the Board, “it can only be assumed that [Commander, Southern Pacific, Adm. William F. Halsey], wishing to recognize this meritorious service, awarded the Navy and Marine Corps Medal.” The board offered Kennedy a Bronze Star medal, if he would return the original award. After becoming a Massachusetts senator and while pondering his run for the presidency, Kennedy raised the issue again after the Navy reiterated the offer in an October 1959 letter. At about that time, he held a meeting with Japanese war veterans. Nothing more was done about the award, and the matter ended with Kennedy’s assassination in 1963. I guess my question that has never been answered to my satisfaction, is how did a destroyer “sneak” up on a PT boat? If the boat’s engines were running why couldn’t it outmaneuver the destroyer? If the engines were shut down, how come they could not hear the engines and movement of the approaching destroyer? Was everyone onboard asleep? Stephen, that’s a great question and one that has, over the years, gotten a number of answers. I understand that PTs in the strait sometimes had only one engine of the three idling, and all of them declutched. Also understand that those nights were extremely dark, but one does have to wonder how it could happen. BTW JFK was awarded the Navy Cross for both the sinking and his actions after as well as the rescue of Marines AFTER he had been rescued and given another boat PT-59. Thanks to everyone who commented. John F. Kennedy’s brother, Joseph Kennedy, was posthumously awarded the Navy Cross for the action in Europe that cost his (Joseph’s) life. I’ve asked a couple of experts on military awards and decorations. None of us believe, or can find any reference saying, that John received this award. We would welcome a source for this.